Mongolian National Chamber of Commerce and Industry held its annual ceremony, “Entrepreneur 2017”, and announced the business sector outperaformers of 2017. Mongolian Copper Corporation was awarded “BEST CORPORATE GOVERNANCE OF THE YEAR”. The company was appreciated for increasing efficiency and introducing best practices at EMC through its 49 percent ownership. 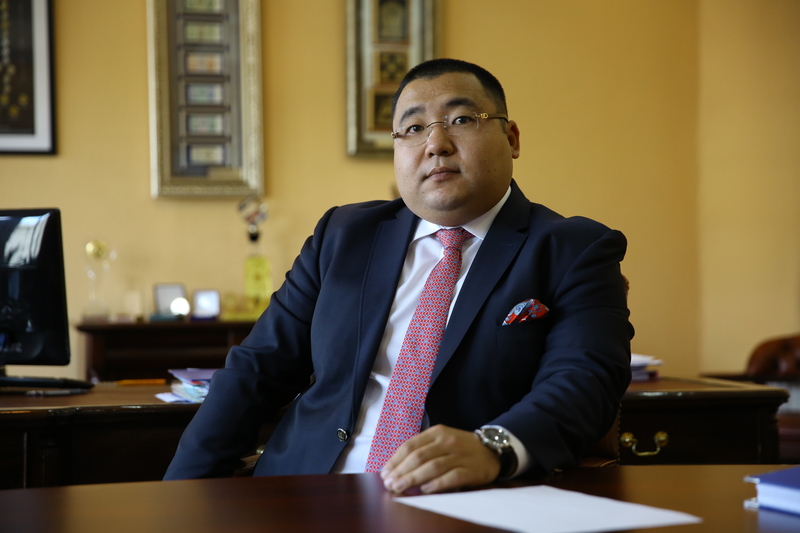 We talked to M. Munkhbaatar, the Chairman of Mongolian Copper Corporation, about good corporate governance. Your company was awarded “Best Corporate Governance of the year”. Let’s start the interview with a question what is good corporate governance? How did your company implement it? Mongolian Copper Corporation initiated and started implementing “Future of Erdenet – 5 Goals” program in December, 2016. In particular, within the goal “Erdenet as transparent”, we have started several initiatives. Previously, in accordance with the agreement between two countries, the plant was quite closed, thus causing for a number of suspicion. Therefore, Mongolian Copper Corporation initiated a goal to make procurement process transparent. In this context, EMC started to announce a tender, and around 500 open tender had been announced by the company at present. As a result, we have saved MNT 15 billion, not reducing the quantity of purchase. Secondly, decision-making system became precise. In other words, it was made clear who will make what kind of decision. In particular, almost all the decisions had been being made by the “General Director” before, but now board members discuss issues, and accordingly make joint decisions. This is only about two of five goals. In the past, 49% of Erdenet has been quite controversial, and subject to court. Did it adversely affect company’s operation? Or was no impact at all? As this was a dispute between shareholders, some impact was inevitable. However, if look back to the General Director Kh.Badamsuren’s press conference in the 3rd quarter of 2016, tax paid to the government increased several times. Furthermore, we raised our employees’ salary for 10% after our board members discussed. Thus, the plant has been operating normally. Cutting cost, we could raise our employee’s salary for 10% despite economic difficulties. What corporate social responsibility activities have you done? Corporate social responsibility is very important to mining companies. Our role in CSR is relatively high. For instance, Mongolian Copper Corporation has decorated 300 meters street with lights with its own fund. Besides, we have organized “New Year Tree Lighting Ceremony”, and handed over new year gifts and greetings to over 2000 children of remote soums of Orkhon aimag. EMC has a secondary school as well. Mongolian Copper Corporation supports operation of kindergarten for paralyzed children. We have given financial support for their building expansion work, and recently sponsored travel cost of disabled children, when they participated in South Asian tournament. Within a year, we’ve solved corporate governance related problems. Most importantly, becoming 100% national company, we’re complying Mongolian laws, regulations, and operating within its framework. Mongolian Copper Corporation is exemplifying good corporate governance by a national company. The tax we paid to the budget was three times higher than previous year’s. What would be the change of Erdenet Mining Corporation in 2018, in comparison with past 10, 20 years’? What do you plan for the coming years? Because of the stable demand on copper, there must be a good future? People see the future positively, as the copper price soared. This is half related that Mongolians see things positively. I, personally, hope the copper price will remain at current level. But, some closed American copper plants are going to open back again. Hence, supply will surpass demand. Still, we expect the copper price to be at this level. We should plan the plant’s future, taking account Erdenet’s financial ability, USD’s fluctuation, and material price. Before, there was unhealthy system in the plant: when copper price rises, operational expenditure increases, and when price drops, operational expenditures declines. Thus, we should pay attention to stabilize unit price. But there are costs to cut, and costs that must not be cut. For instance, what are the costs to be cut, and what are not? In particular, human resource is the most valuable to plant’s operation, thus it should not be economized in any case. Only incompetence management teams cut this cost. Erdenet plant never should cut human resource cost. We never should treat unfairly those people, who devoted their lives, and hard work to the plant. Other operational costs should be cut and kept at right level though. Is it the worst management that most of the companies cut vacancies, and reduce salaries during economic crisis? That is an evidence of incompetent management. Only lazy, and incompetent managers do that. Most entrepreneurs now quite argue on whether bank interest can be reduced or not. What is your opinion on this issue? Interest is the price of product, and the fundamental factor is deposit interest rate. It is impossible to reduce loan interest rate, if deposit interest rate is high. It is important to find out fundamental reason. Please introduce yourself. What is your profession, and where have you been working? I am a national product. I’ve graduated from high school in Mongolia. In the past 10 years, I’ve been working in banking and investment management field, and have done many deals, and involved with a significant role in many contacts and agreements. I major in banking, business administration and economics. I’ve been working in my profession for 14, 15 years. I’ve got two beautiful children. How do you see the investment climate of Mongolia? Foreign investment has become basically stagnant. What will happen in the future? Foreigners have seen that the government has taken private company’s property in March, 2017. This may have made them fear to invest in Mongolia. We’ve purchased and brought Russia’s stake in Erdenet fully to Mongolia. But the government has taken our stake, even though we’ve brought the stake that had been belonging to Russian for 37 years. We’ve shown that Mongolian companies are competent to make global scaled deal. So, how foreigners will invest to Mongolia, when government is behaving like this? Please introduce Board members of Mongolian Copper Corporation? In our Governing Board team, there are young people who are just 30, and have work experiences in international banks and mining companies. All of them have graduated abroad. What unites us is the courage to work for development of Mongolia. We’re working hard, neglecting our private lives. However, there are also people who have senior expertise such as Mr. Hurts. It is considered that the General Director of EMC, Kh. Badamsuren was chosen because of his political party affiliation. Do you affiliate with any political party? We are not affiliated to any political party. We want the government to be stable, and law to be true. Mr. Badamsuren is one of the leading & recognized experts in Mongolia. He represents a shareholder, in particular the Mongolian Government. The executive board consists of seven members, four of them are delegated by the Mongolian Government. The Chairman is Mr. Byambasuren, who was recommended by Government side.